A culinary revolution has taken place in Norway during the last few years, led by a wave of innovative Norwegian master chefs like Pettersen. Every other year, 24 of the most promising chefs in the world meet in Lyon in France to participate in the world’s most prestigious culinary competition. Since the competition was first held in 1987, Norway has won five gold, three silver, and now three bronze medals, making us the country with the most Bocuse d’Or awards. There is definitely something cooking in the Nordics now – all three medalists in 2019 came from Scandinavia, making it a go-to region for food lovers. Many other Norwegian chefs have also obtained a worldwide reputation and, over the last few years, an increasing number of Norwegian restaurants have received stars in the Michelin guide. In 2016, Maaemo became the first restaurant in Norway to get three Michelin stars. The opening of the world’s largest underwater restaurant Under in the spring of 2019 will bring Norway even higher up on the bucket list for serious gourmets. 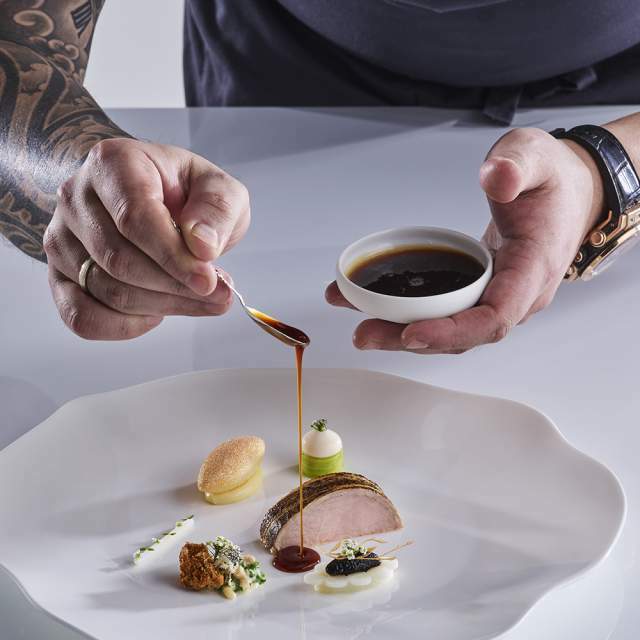 This year’s Bocuse d’Or is not the only international competition in which Norway has recently performed well. In November, the local cheese Fanaost from Ostegården won the gold medal during the World Cheese Awards in Bergen, and a goat cheese from Telemark came in second. This was the second time a Norwegian cheese won the world’s biggest cheese competition. In 2016, the blue cheese Kraftkar from the tiny producer Tingvollost in Fjord Norway was chosen as the Champion of Champions – simply the best cheese of all time. Bocuse d’Or is a biennial world chef championship that takes place in Lyon, France. Candidates representing 24 countries give their best in hope of winning the greatest contest in modern cuisine. Since the competition was first held in 1987, Norway has achieved five gold medals, three silver, and now three bronze medals. Christian André Pettersen’s food can be experienced at the restaurant Mondo in the Stavanger region, where he is the head chef. Restaurant: Bekkjarvik Gjestgiveri, in Austevoll municipality south of Bergen. Herring comes in increasingly many variations, with a myriad of marinades and flavors. A dried and crispy form of bread, far thinner than even the fanciest laptop, and most often sold in a protective carton. Delicious with soups, stews, or topped with cured meats and sour cream. A traditional soft flatbread of flour, potatoes, milk and butter, and made by the help of traditional tools. Waffles are the core of Norwegian coziness.